My watch is nearing it’s end. It’s almost 0400 and off in the distance I can see the pale grey lights of Papeete, Tahiti illuminating the dark purple sky. I hear Dan start to stir in the cabin so I head below to make coffee for us. I won’t be going back to sleep now. We’ve only got a couple more hours until we arrive and I always enjoy watching the sun come up as we enter a harbor. We reach the western tip of the island and finally the large rollers start to settle down a bit. The sun is coming up over the mountainous island and we’re both ready to get into port. We are going to stay at the Tahiti Yacht Club. We will be moored out but it will be nice to have a place with hot showers and laundry facilities. There’s a reef that surrounds the island so I head to the bow pulpit to stand watch. We talk back and forth on our headsets as we watch the island grow larger. We are about a quarter mile out when we begin to hear the noises of the city. It’s immediately obvious we are going to be experiencing a bit of culture shock. The sound alone is much louder than we’re used to these days. After all, the places we’ve been over the past few months have had sometimes as few and 50 or 60 residents and Papeete alone has over 137 thousand. Yes, this will take some getting used to for us. We arrive at a mooring ball and once we are all tied off it’s time for our anchor down beers. There won’t be much time to settle in, however, as we’ve a long list of parts and supplies we hope to acquire here. This is the first place we’ve seen since México that has a large offering of provisions and boat supplies. We waste no time in getting to shore. 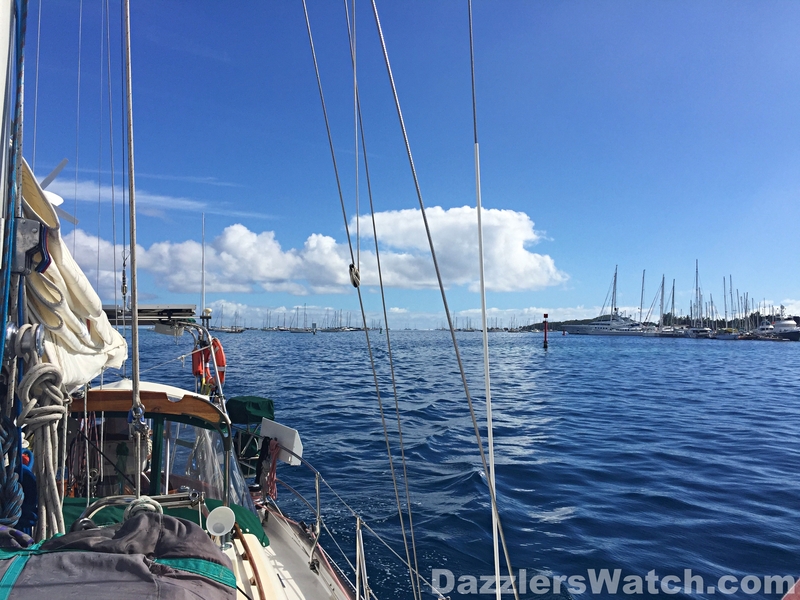 One thing we’ve been warned about is theft here in Papeete so for the first time since I’ve been on board Dazzler we actually take a cable and lock to secure Sparkle to the dinghy dock. On shore we spend a few minutes trying to find out who we pay for the mooring. No one speaks very good English and as I’ve said before, our French leaves a lot to be desired. After about fifteen minutes we find the man in charge. He tells us not to worry about paying since we’ll only be there a night or two. He provides us with keys to the shower and is nice enough to phone a taxi for us to get to downtown. The taxi driver is much like those in México and the rest of the world. He’s hurried and changing lanes frequently. There’s tons of traffic and noise and chaos everywhere. I can feel myself becoming overwhelmed by it all. I sense Dan is feeling the same. The first stop is to drop off our propane tank. We ran out of propane while I was making coffee this morning. The driver drops us at a gas station but it’s not what we’ve read in the compendiums so we are feeling ill at ease. The guy inside assures Dan everything is fine and so we leave our tank hoping we will see it again in a few days. The good news for me is I can’t cook so we’ll have to try some of the restaurants here until it comes back. Now it’s time to head into the commercial district to locate marine supply stores and such. As we walk the streets I’m feeling more uncomfortable by the moment. It’s very loud and crowded and nothing at all like the peaceful places we’ve enjoyed along our journey. It’s also very dirty. There’s trash everywhere with large piles of it on almost every street corner. Some is in bags but much isn’t so it’s left to the whim of the wind. México is not the cleanest country but I’m feeling like Papeete is the worst we’ve seen. We walk from part store to part store and are not having much luck. It’s frustrating. We’re hot and both of us are exhausted. We did manage to find a couple of items but not nearly as much as we hoped. Finally we leave one store and decide it’s time to head back to the waterfront to get a bite to eat before going back to the boat to crash. We have a tourist map that we picked up so we leave the last store and see what appears to be a shortcut back to the waterfront. As we start walking down this street it becomes immediately apparent we have taken a bad turn. All of the sudden we see lots of less than savory characters milling about. One look down beside a building and I see tents and mothers with babies sitting on the ground. It’s pure squaller. Everyone is looking at the two of us knowing we certainly don’t belong here. On the walls there are signs of gang activity in the form of tagging. I’ve got my cell phone in my hand so I ever so slightly slide it into my backpack which I hold onto tightly with both hands. Dan’s head is on a swivel. He’s watching everyone and everything and sticking very close to me. It is the longest five minute walk of my life. As we reach the end of the road we head right toward the water. We walk about a hundred or so yards and then stop so Dan can look at the map. He’s got his back to a wall and I’m standing guard. Then from the street we had just walked down, a young man in his twenties comes out as if he’s looking for us. When he sees me staring straight at him he quickly turns back and leaves. Phew! I’m ready to get the hell out of Dodge and soon!!! We make our way back to the waterfront and stop at a little bar called the Bora Bora Lounge. It’s all open air and they have fans with misters to keep us cool. We sit down and order a picture of beer and some lunch. We both discuss the fact that we do not want to stay in this place any longer than necessary. It’s obvious there is a lot of crime here. Yes, it looks beautiful from the water and even the first couple of blocks off the water are nice and fairly clean but if you get more than three blocks from there it’s dangerous territory. Dan even tells me I’m not allowed to wear my jewelry to town again. I never wear much but he’s afraid any of it will attract the criminal element. The good news is we fell in love with the BBL. Isabella who is currently the manager but is working to buy the place is a complete sweetheart. And the food there is off the charts good. Oh yes, super fast free wifi as well. That’s something after months of sluggish connections. During our stay here we visit there almost daily for lunch or happy hour. After one night we decide to move the boat to the Downtown Papeete Marina. A taxi ride from the TYC was 30 PFC one way to downtown. As much as we don’t want to deal with the noise, we do like the idea of being walking distance to stores and such. Also, many other cruisers that we know from México are there so it will be nice to catch up. My new hairdo, necklace and pareo and I’m ready to hit the town for a special dinner with my honey and our friends, Ed & Linda of SV One Fine Day! We end up spending about twelve days in Papeete. Unfortunately it took us that long to get the supplies we need and make a few repairs to Dazzler and we did have some great things go on. For me, I got the best haircut I’ve ever had there. The second is that my amazing man bought me a beautiful black pearl necklace. He saw it in the store and told the lady to put it on me. Once it was on he said it was perfect and I needed to have it! I love this man! So, what are the good things about Papeete? Well, in addition to the BBL and Isabella, we did find a few other redeeming qualities. Obviously provisioning was good. We finally were able to find real iceberg lettuce so we got to have some really good salads. They have great meats and lots of amazing cheeses to choose from. Liquor was a little less expensive than in the Marquesas and Tuomotos but I’m still drinking rum because I refuse to pay $60 USD for a small bottle of vodka. In one store we saw the small bottle of Grey Goose for…wait for it… $92 USD! It was nice to have a variety of different, quality restaurants to choose from as well. And, being near our dear friends, Ed & Linda was awesome too! We spent quite a bit of time together and shared many a meal while we were there. One night we had them over to Dazzler for some of Dan’s famous Arracharra Tacos and Ed even treated several of us to a delicious meal of Orange Beef! Oh yeah! There’s a wonderful fresh fish and vegetable market called the Marché de Papeete. It’s a huge, two story building where you can find the freshest fish and veggies at really good prices. You can pick up other touristy things as well like t-shirts, hats, bags, jewelry etc… It’s open Monday to Saturday and turned out to be a great spot for us. We had fresh tuna several times while we were here. It was $5 USD/kilo. Can’t beat that! In the evenings starting around 1800 at the Place Vai’ete along the waterfront the roulottes start to open up. These are food trucks and they set up tables and chairs and serve everything from Chinese to hamburgers, to ice cream to steak and frites (fries). We tried them three times. My first experience wasn’t all that great. I ordered fried shrimp. They batter them, then deep fry them with the heads & shells on. By the time you get the heads and shells off the coating is gone. And, they were so hot I literally scorched the tips of my fingers. But, I didn’t let this keep me from trying again. That’s when I found the beef satay and OMG was it awesome! I was immediately hooked. In fact, we’d have come back several more times but we only got one more chance before we left. If you’re coming by boat I’d recommend staying that the downtown marina. The location is perfect because you can walk to just about everything. And the shower facilities were nice and water was hot, unlike at the TYC which not only had no hot water but the water and lights are on a timer. There’s nothing like the lights going off while you’re in the shower. No, not a good thing. As far as we’re concerned, Tahiti is not paradise! There’s too much chaos, noise and crime. I actually did some reading on the crime there and it’s pretty bad. One elderly man was recently robbed and beaten with a rock near the ferry terminal. Some good samaritans stopped and ran the bad guys off. They called the police and an ambulance. The ambulance came but the police never did. And that’s not a one time thing. Basically they say the local police do virtually nothing. There is definitely a drug problem and no doubt there are gangs. Ask a local business owner and they will say there is little crime but anyone with eyes can see that’s not true. They just don’t want to run off the tourists. No, Tahiti didn’t do much for us. In fact we said we’d only stop back there if we were on a path that led us nearby and we needed to provision and even then we would do it much more expeditiously and move on. One final note that I feel must be included to be fair is that we only stayed in Papeete. We did not move around the island to the less congested areas where there are more resorts etc… It may be a lot different there but we’re guessing there is still going to be significant crime as the criminals prey on tourists. There’s no doubt that Tahiti is putting on a show for the tourists and they depend upon them. It was honestly a bit disappointing for us as we’ve both always dreamed of going to Tahiti. You know the image…palm trees swaying as they lean out over a white sand beach that is being kissed by gin colored waters??? Unfortunately that was not our experience but we know there are many more beautiful and amazing places in our future and we’re glad we did visit even if it didn’t live up to our expectations.